May might be the month for flowers, but it’s also the month motorcycle enthusiasts wait for all year. Warmer weather means motorcycles are out of winter storage (at least in the colder states), tuned up, and back on the roads for another riding season. That’s also why May is Motorcycle Awareness Month. 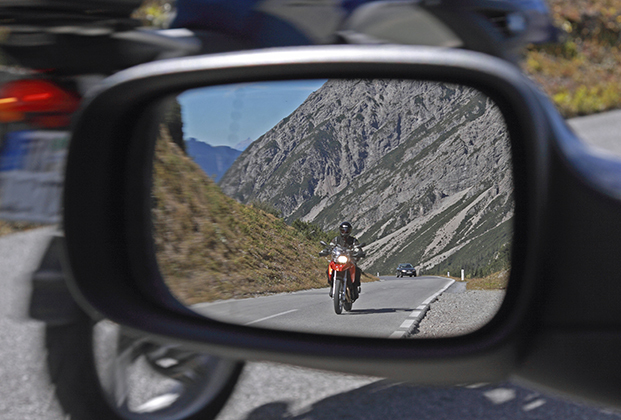 As motorcycle riders hit the roads in spring, vehicle drivers often aren’t alert to them. Keeping bikers safe and drivers alert is the goal of the national organization for the Alliance of Bikers Aimed Toward Education, or ABATE. This 38-year-old organization operates throughout the U.S., with each state in charge of its own program. Stan Oakes, facilities manager at Kennametal in Latrobe, Pa., is a long-time motorcycle enthusiast and an active volunteer in the Pennsylvania chapter of ABATE. As the public relations officer for ABATE, he’s passionate about getting the word out to motorcyclists and vehicle drivers alike that safety is the first priority on the road. While Kennametal has a 100% Safe campaign for its workplaces, Mr. Oakes says ABATE strives for the same for all motorcyclists. What’s the biggest fear of most motorcycle riders? To avoid an accident (with a motorcycle or another vehicle), vehicle drivers should keep both hands on the wheel and give driving your full attention (see our blog on distracted driving). Never assume other drivers see you, even with your headlight on. Never assume you have right of way. Be courteous to be safe. Always look both ways when entering an intersection from a red light. Don’t tailgate vehicles (and vehicle drivers, don’t tailgate motorcycles). Don’t drink and ride. Obey posted speed limits. Wearing a helmet is safer than not. Know your state’s helmet laws. “SEE” the big picture on the road ahead: Search with your eyes; Evaluate the situation; Execute properly. Consider wearing high-visibility clothing during day rides and a reflective vest when night riding. Neither riders nor passengers should wear short sleeves, shorts, sandals, or flip-flops. Remember, road rash is painful. If a deer jumps in front of you, it’s best to gear down fast, brake hard, and, if you have to, hit the deer instead of laying down the bike. Veering to the side can cause other dangers, and deer generally are softer than an embankment. Wear proper eye protection. Check out a local motorcycle dealership that sells eyewear that self-tints to existing light and is designed to prevent dry eyes while riding. Mr. Oakes and other ABATE volunteers visit high school driver education classes, senior centers, and delivery truck staff at local companies as part of the Operation Save a Life (OSAL) campaign. They share tips for vehicle drivers to make them more alert to motorcycles and raise safety awareness. They also spread the word through bright yellow “Watch for Motorcycles” stickers and “Look Twice, Save a Life” signs distributed by volunteers. Mr. Oakes has presented to nearly 2,000 high school students in his efforts to promote motorcycle awareness and safety. If you own a motorcycle or are thinking of getting one, a motorcycle safety course is a must for responsible riders. Most states offer them for a fee through transportation departments or community colleges. In Pennsylvania, ABATE and PennDOT have teamed to offer the Motorcycle Safety Program free of charge to residents. Nearly 19,000 people have been trained through the program, which even provides a motorcycle for use by each attendee during the program. Regardless of whether you’re on two wheels or four tires, be courteous, be respectful, and be alert. After all, everyone wants to get home safely. Are you a motorcycle enthusiast? What tips can you offer to other riders or drivers to stay 100% Safe? Share your comments.